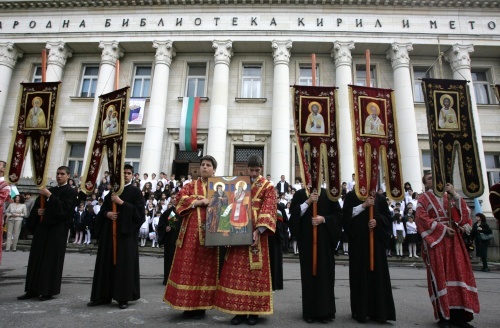 Bulgarians from around the country and the world are paying tribute Monday, May 24, to the deed of Saint Cyril and Saint Methodius, the creators of the Cyrillic alphabet. Bulgaria celebrates May 24 as the day of the Bulgarian Education and Culture and Slavic Script, the official Day of Holy Brothers St. Cyril and St. Methodius - the Byzantine scholars who wrote the first Slavic alphabet in 855 A.D., and translated into Old Bulgarian the Bible and the religious literature of Orthodox Christianity. The first celebration in commemoration of Sts Cyril and Methodius occurred 156 years ago in a Plovdiv school, currently after the name of the Saints. Bulgaria celebrates May 24 as an official holiday under a decision of the National Assembly dated 30 March 1990. The brothers were born in Thessalonica, in 827 and 826 respectively. Both were outstanding scholars, theologians, and linguists. In the 9th century the Holy Brothers Sts. Cyril and Methodius created the Slavic alphabet and made the first translations in it. Their disciples introduced the alphabet in Bulgaria, putting the beginning of its journey to the world. Several centuries later, Patriarch Evtimii launched a literary reform and updated the alphabet, assuming that words are expression of the divine essence of things. Pope John Paul II proclaimed the two Sts Cyril and Methodius Co-patrons of Europe together with St Benedict of Norcia in 1980.